A student of Jean Léon Gérôme and William Merritt Chase, Dennis Miller Bunker was equally adept at academic portraits and open-air landscape paintings. By his death, Bunker had already established a mastery and sensitivity unmatched by most of his peers. Born in 1861 in New York, Bunker grew up in Long Island as one of four children. At the age of fifteen, he enrolled in the Art Students League and the National Academy of Design where he studied for four years. 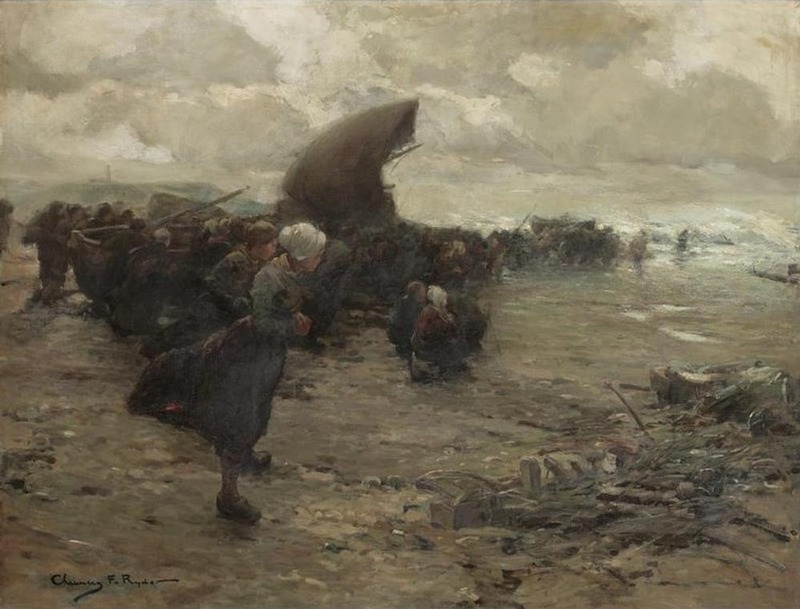 Like most young, American artists, Bunker longed for European instruction, so in 1882 he left for the École des Beaux-Arts in France with a letter of introduction. Bunker studied at the École for two years under Jean Léon Gérôme. Upon his return to America, Bunker immediately began exhibiting his works, winning a prize in the National Academy show in 1885. The next year, he moved to Boston and accepted a position as head of the anatomy and figure classes at Cowles Art School. That same year, Bunker held his first one-man show at the Noyes Gallery. His 22 paintings included landscapes, still life’s, portraits and figure studies. He was introduced to Boston society and received commissions for portraits from influential patrons, including Isabella Stewart Gardner. It was through this mutual acquaintance that Bunker met John Singer Sargent. Sargent painted Bunker’s portrait, befriended him and greatly influenced his painting style. 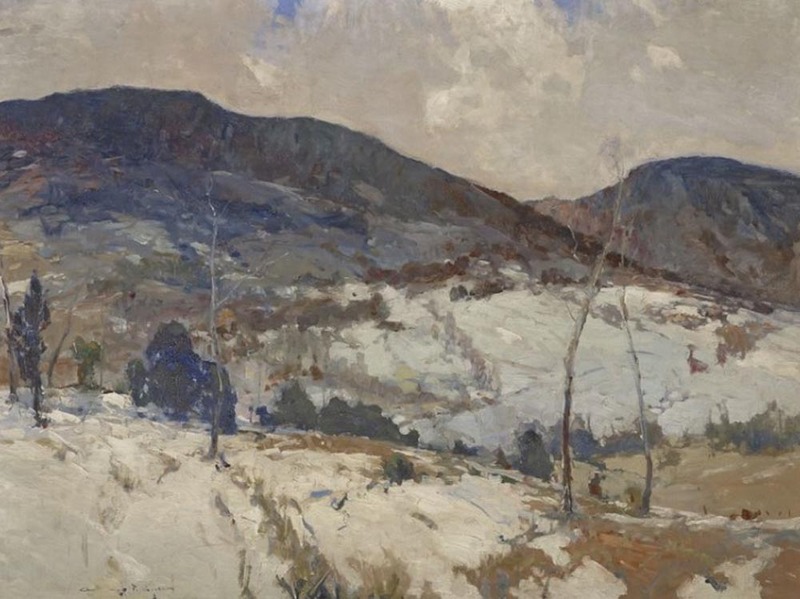 Bunker’s brushwork became more confident and his palette lightened—moving toward an Impressionist style. Never comfortable in Boston, Bunker moved back to New York in 1889. His illustrious circle of artists and friends included Charles Platt, Abbott Thayer, Thomas Dewing, William Chase and John Singer Sargent. In 1990, Bunker showed his Impressionist paintings to mixed reviews. He won an award for a portrait in the same year at the Art Institute of Chicago and was asked to take over Chase’s classes in Brooklyn. In October, Bunker married Eleanor Hardy. A month later, he won a gold medal for the painting “The Mirror”, in Philadelphia. Bunker and his new wife traveled to the Hardy family home for the holidays. On Christmas day, Bunker complained of feeling chilled. He tragically died three days later at the age of twenty-nine. QuoteIt is so easy to be smart in Art, so easy to catch this and that quality of the time or the taste, the frightful smug taste of the public-so easy to do all manner of tricks of sentiment- of lies that people love and hug and live with and praise. Percy Gray was born in San Francisco, California. At 16 years of age, Gray enrolled in the California School of Design where he studied with Virgil Williams, Raymond D. Yelland and Emil Carlsen. After graduation, Gray took a job as a quick sketch artist with the Morning Call, a major San Francisco newspaper. 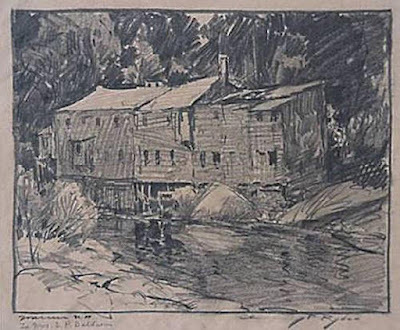 Gray honed his drawing skills as newspaper artists were expected to sketch on site for the paper. Gray came to the attention of the illustrious William R. Hearst who hired the young artist to work for his newspaper, the New York Journal. Gray spent 11 years with the New York Journal. While in New York, he studied with William Merritt Chase. Gray returned to his native California in 1906 to cover the devastation of the 1906 earthquake for the Hearst newspapers. Gray decided to remain in San Francisco working for the Examiner. Gray began to turn more of his attention to personal artwork and found a market for his watercolors depicting Northern California scenes. The public and critics alike responded to his realistic, yet romantic views of nature. Gray worked mostly as a Tonalist, preferring the muted tones of Barbizon Painting rather than the pure color of Impressionism. However, Gray occasionally worked in a brighter palette. In 1923, Gray married Leone Plumley Phelps, a 35 year old divorcee and moved to Monterey. The Gray’s bought the historic Casa Bonifacio Adobe. For the next 16 years, Gray painted the thriving Monterey area. 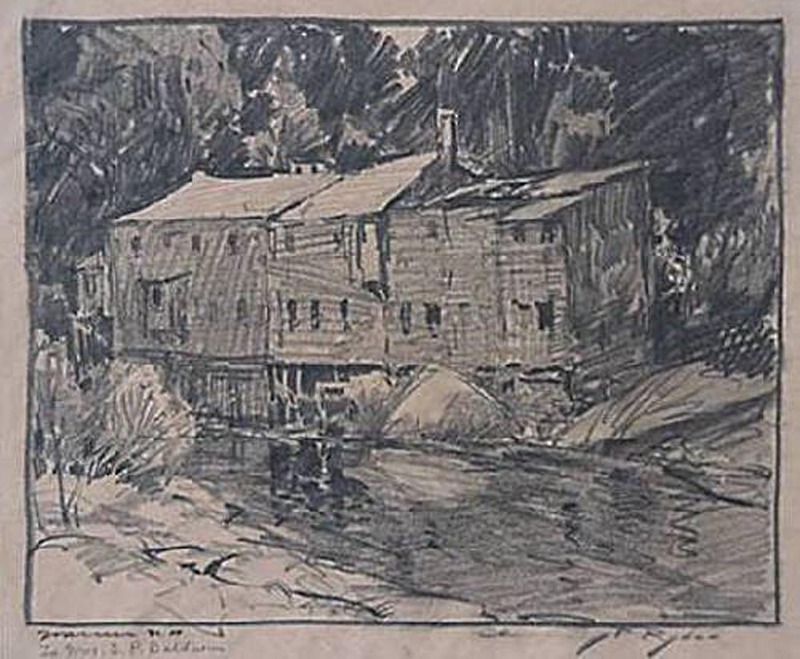 During this time, he added etching to his repertoire and produced some fine works in that medium. In 1939, The Grays sold their home and moved to Marin County, just north of the Golden Gate Bridge. In 1951, after his wife’s death, Gray moved to San Francisco to live at the Bohemian Club. He also rented a studio on Sutter Street near Union Square. 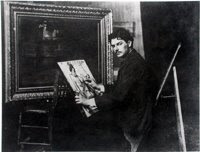 Percy Gray died at his easel from a heart attack in October of 1952. Chauncey Foster Ryder was born in 1868 in Danbury Connecticut. Ryder studied at the Art institute of Chicago and at the Académie Julian in Paris under Jean Paul Laurens. Ryder is most often associated with the Tonalist and Post-Impressionist art movements. His work leans toward abstraction without giving up representational depictions completely. A strong sense of design and powerful brush calligraphy are apparent in both his oils and watercolors. His use of greens and grays led to the term Ryder Green in his paintings. 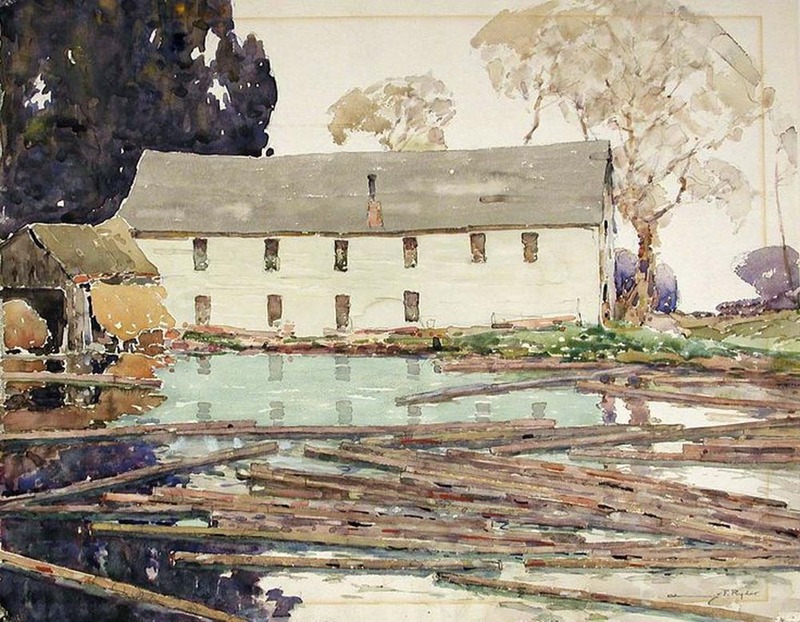 Ryder was equally skilled as a watercolorist and oil painter. 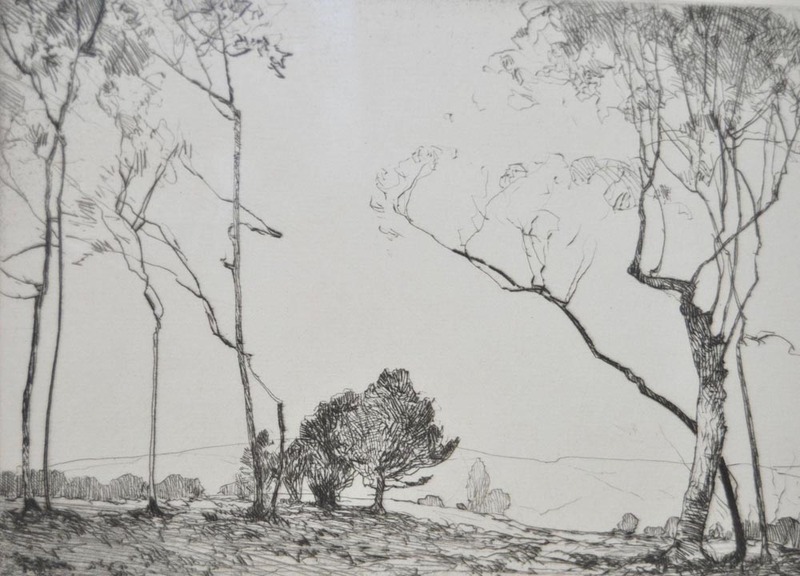 Starting around 1910 he also made etchings and lithographs. He kept studios in both New York and New Haven. He was honored as an Academician of the National Academy of Design in 1914. He is represented in over 50 Museum collections with three paintings in the Smithsonian collection. During his career, he was awarded many gold medals for both his oils and watercolors. Some of his awards were from the National Academy, the 1915 Panama-Pacific Exposition, The National Arts Club, The American Watercolor Society and The New York Watercolor Society. Chauncey Foster Ryder died in Wilton, New Hampshire in 1949.